Motto: "One People One Destiny"
If considered as a single entity. 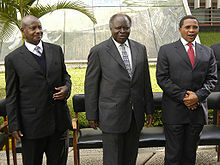 From left to right: President Yoweri Museveni of Uganda, President Mwai Kibaki of Kenya, and President Jakaya Kikwete of Tanzania during the eighth EAC summit in Arusha, November 2006. Kenya, Tanzania, and Uganda have cooperated with each other since the early 20th century. The customs union between Kenya and Uganda in 1917, which Tanganyika joined in 1927, was followed by the East African High Commission (EAHC) from 1948 to 1961, the East African Common Services Organization (EACSO) from 1961 to 1967, and the 1967 to 1977 EAC. Burundi and Rwanda joined the EAC on 6 July 2009. Inter-territorial co-operation between the Kenya Colony, the Uganda Protectorate, and the Tanganyika Territory was formalised in 1948 by the EAHC. This provided a customs union, a common external tariff, currency, and postage. It also dealt with common services in transport and communications, research, and education. Following independence, these integrated activities were reconstituted and the EAHC was replaced by the EACSO, which many observers thought would lead to a political federation between the three territories. The new organisation ran into difficulties because of the lack of joint planning and fiscal policy, separate political policies, and Kenya's dominant economic position. In 1967, the EACSO was superseded by the EAC. This body aimed to strengthen the ties between the members through a common market, a common customs tariff, and a range of public services to achieve balanced economic growth within the region. In 1977, the EAC collapsed. The causes of the collapse included demands by Kenya for more seats than Uganda and Tanzania in decision-making organs, disagreements with Ugandan dictator Idi Amin who demanded that Tanzania as a member state of the EAC should not harbour forces fighting to topple the government of another member state, and the disparate economic systems of socialism in Tanzania and capitalism in Kenya. The three member states lost over sixty years of co-operation and the benefits of economies of scale, although some Kenyan government officials celebrated the collapse with champagne. Presidents Daniel arap Moi of Kenya, Ali Hassan Mwinyi of Tanzania, and Yoweri Kaguta Museveni of Uganda signed the Treaty for East African Co-operation in Kampala on 30 November 1993 and established a Tri-partite Commission for Co-operation. A process of re-integration was embarked on involving tripartite programmes of co-operation in political, economic, social and cultural fields, research and technology, defence, security, and legal and judicial affairs. The EAC was revived on 30 November 1999, when the treaty for its re-establishment was signed. It came into force on 7 July 2000, 23 years after the collapse of the previous community and its organs. A customs union was signed in March 2004, which commenced on 1 January 2005. Kenya, the region's largest exporter, continued to pay duties on goods entering the other four countries on a declining scale until 2010. A common system of tariffs will apply to goods imported from third-party countries. On 30 November 2016 it was declared that the immediate aim would be confederation rather than federation. The presidents of Kenya and Rwanda invited the Autonomous Government of Southern Sudan to apply for membership upon the independence of South Sudan in 2011, and South Sudan was reportedly an applicant country as of mid-July 2011. Analysts suggested that South Sudan's early efforts to integrate infrastructure, including rail links and oil pipelines, with systems in Kenya and Uganda indicated intention on the part of Juba to pivot away from dependence on Sudan and toward the EAC. Reuters considers South Sudan the likeliest candidate for EAC expansion in the short term, and an article in Tanzanian daily The Citizen that reported East African Legislative Assembly Speaker Abdirahin Haithar Abdi said South Sudan was "free to join the EAC" asserted that analysts believe the country will soon become a full member of the regional body. On 17 September 2011, the Daily Nation quoted a South Sudanese MP as saying that while his government was eager to join the EAC, it would likely delay its membership over concerns that its economy was not sufficiently developed to compete with EAC member states and could become a "dumping ground" for Kenyan, Tanzanian, and Ugandan exports. This was contradicted by President Salva Kiir, who announced South Sudan had begun the application process one month later. The application was deferred by the EAC in December 2012, however incidents with Ugandan boda-boda operators in South Sudan have created political tension and may delay the process. In December 2012, Tanzania agreed to South Sudan’s bid to join the EAC, clearing the way for the world’s newest state to become the regional bloc’s sixth member. In May 2013 the EAC set aside US$82,000 for the admission of South Sudan into the bloc even though admission may not happen until 2016. The process, to start after the EAC Council of Ministers meeting in August 2013, was projected to take at least four years. At the 14th Ordinary Summit held in Nairobi in 2012, EAC heads of state approved the verification report that was presented by the Council of Ministers, then directed it to start the negotiation process with South Sudan. A team was formed to assess South Sudan's bid; however, in April 2014, the nation requested a delay in the admissions process, presumably due to ongoing internal conflict. South Sudan's Minister of Foreign Affairs, Barnaba Marial Benjamin, claimed publicly in October 2015 that, following evaluations and meetings of a special technical committee in May, June, August, September and October, the committee has recommended that South Sudan be allowed to join the East African Community. Those recommendations, however, had not been released to the public. It was reported that South Sudan could be admitted as early as November 2015 when the heads of East African States had their summit meeting. South Sudan was eventually approved for membership to the bloc in March 2016, and signed a treaty of accession in April 2016. It had six months to ratify the agreement, which it did on 5 September, at which point it formally acceded to the community. It does not yet participate to the same extent as the other members. The geographical region encompassed by the EAC covers an area of 2,467,202 square kilometres (952,592 sq mi), with a combined population of about 173,583,000. Three EAC countries border Lake Victoria. Mount Kilimanjaro, Africa's tallest peak, located in Tanzania. Diani Beach, Kilifi County, Kenya. It has been argued, however, that the commonalities go far deeper. Many of the national elites old enough to remember the former EAC often share memories and a sharp sense of loss at its eventual dissolution. More cynically, others have argued that this historical ambition provides politicians with the ability to present themselves as statesmen and representatives of a greater regional interest. Furthermore, EAC institutions bring significant new powers to dispose and depose to those who serve in them. Some have questioned the extent to which the visions of a political union are shared outside the elite and the relatively elderly, arguing that the youthful mass of the population is not well informed about the process in any of the countries. Others have pointed to an enhanced sense of East African identity developing from modern communications. For these, the shared vision for a politically united East Africa is commendable and a potential driver for change. Commitment to the formal EAC idea is relatively narrow, in both social and generational terms, and thus many have questioned the timetable for the project. Fast-tracking political union was first discussed in 2004 and enjoyed a consensus among the three presidents of Kenya, Tanzania, and Uganda. Thus, a high-level committee headed by Amos Wako of Kenya was commissioned to investigate the possibility of speeding integration so as to achieve political federation sooner than previously visualised. Yet, there have been concerns that rapid changes would allow popular reactionary politics against the project. There has been an argument, however, that there are high costs that would be required at the beginning and that fast-tracking the project would allow the benefits to be seen earlier. There remain significant political differences between the states. Museveni's success in obtaining his third-term amendment raised doubts in the other countries. The single-party dominance in the Tanzanian and Ugandan parliaments is unattractive to Kenyans, while Kenya's ethnic-politics remains absent in Tanzania. Rwanda has a distinctive political culture with a political elite committed to building a developmental state. Other problems involve states being reluctant to relinquish involvement in other regional groups, e.g., Tanzania's withdrawal from COMESA but staying within the SADC bloc for the Economic Partnership Agreement negotiations with the European Union. Many Tanzanians are also concerned because creating a common market means removing obstacles to the free movement of labour and capital. Free movement of labour may be perceived as highly desirable in Uganda and Kenya, and have important developmental benefits in Tanzania; however, in Tanzania there is widespread resistance to the idea of ceding land rights to foreigners, including citizens of Kenya and Uganda. Informal polls have indicate that most Tanzanians (80 percent) have an unfavourable view of the East African Federation. Tanzania has more land than all the other EAC nations combined (at least until the accession of South Sudan), and some Tanzanians fear landgrabs by the current residents of the other EAC member nations. The East African Court of Justice is the judicial arm of the community. The East African Legislative Assembly (EALA) is the legislative arm of the community. The EALA has 27 members who are all elected by the National Assemblies or Parliaments of the member states of the community. The EALA has oversight functions on all matters that fall within the community's work and its functions include debating and approving the budget of the community, discussing all matters pertaining to the community and making recommendations to the council as it may deem necessary for the implementation of the treaty, liaising with National Assemblies or Parliaments on matters pertaining to the community and establishing committees for such purposes as it deems necessary. Since being inaugurated in 2001, the EALA has had several sittings as a plenum in Arusha, Kampala, and Nairobi. The Speaker of the Assembly is Dan Kidega from Uganda who replaced Margaret Zziwa also from Uganda , after being impeached; she had succeeded Abdirahin Haithar H. Abdi from Kenya. The assembly has been credited with crucial bills, particularly those regarding regional and international trade, including EAC's stand on issues such as the World Trade Organization and transport on Lake Victoria. In 2010, Tanzanian officials expressed interest in inviting Malawi, the Democratic Republic of the Congo, and Zambia to join the EAC. Malawian Foreign Affairs Minister Etta Banda said, however, that there were no formal negotiations taking place concerning Malawian membership. Sudan applied to join the EAC in 2011, but its membership is strongly opposed by Tanzania and Uganda. They contended that because of Sudan's lack of a direct border with the EAC at the time, its allegedly discriminatory actions toward black Africans, its record of human rights violations, and its history of hostilities with both Uganda and South Sudan, it was ineligible to join. Sudan's application was rejected by the EAC in December 2011. Representatives of Somalia applied for membership in the EAC in March 2012. The application was considered by the EAC Heads of State in December 2012, which requested that the EAC Council work with Somalia to verify their application. In February 2015, the EAC again deliberated on the matter but deferred a decision as verification had not yet started nor had preparations with the government of Somalia been finalized. Different rates are applied for raw materials (0%), intermediate products (10%) and finished goods (25%), the latter percentage is fixed as the maximum. This represents a significance decrease from what was previously the maximum in Kenya (35%), Tanzania (40%) and Uganda (15%). However, this customs union is not yet fully implemented, because there is a significant list of exclusions to the Common External Tariff and tariff-free movement of goods and services. Technical work is also needed to harmonise and modernise the customs procedures in the EAC's major ports of entry. The expected revenue benefits are understood to be minimal by many analysts, based on comparative-static simulation exercises demonstrating the one-off impacts of the immediate introduction of the CU's full tariff package. The findings suggest an increase in intraregional trade that is largely the result of trade diversion, not trade creation, with some aggregate welfare benefits in Kenya and Tanzania but welfare losses in Uganda. From a trade-integration perspective, the EAC may not be the best chosen unit, because the current trade between the three countries is small compared to their external trade, and the EAC's 105 million citizens do not represent a large market in global terms, given the very low average incomes. Kenyan firms have successfully aligned to the lower protection afforded by the EAC CET and fears that firms would not adjust to a 25% maximum CET, or would relocate to Tanzania or Uganda have not been realised. An intraregional division of labour is developing that results in basic import-processing relocating to the coast to supply the hinterland. The final stages of import-processing (especially those bulky finished goods that involve high transportation costs) and natural-resource based activities, are moving up-country and up-region, either within value chains of large companies or different segments located by firms in different countries. Trade in goods and services has already increased as service provision to Kenyans and Tanzanians is already important for Uganda (in education and in health). Kenya exports financial services, for example via the Kenya Commercial Bank and purchase and upgrading of local operators in Tanzania, Uganda and Sudan. Uganda hopes integration will help support its tourism potential through integration with established regional circuits. There are signs of a business culture oriented to making profits through economics of scale and not on protectionism. The EAC negotiates with trade partners on behalf of all member countries. Negotiations in 2014 for an EU-EAC Economic Partnership Agreement (EPA) ran into difficulties with the January 2014 negotiating session failing to conclude the negotiations, which were scheduled to be completed before 1 October 2014. This caused tensions between Kenya and other countries as Kenya, which is not a Least Developed Country, stood to lose most from the failure to reach agreement. Discussions are also under way between the EAC and the USA on the launch of Trade and Investment Partnership (TIP) negotiations. EAC economies have large informal sectors, unintegrated with the formal economy and large business. The concerns of large-scale manufacturing and agro-processing concerns are not broadly shared by the bulk of available labour. Research suggest the promised investments on the conditions of life of the region's overwhelmingly rural poor will be slight, with the significant exception of agro-industrial firms with out-grower schemes or that otherwise contribute to the co-ordination of smallholder production and trade. It is informal trade across borders that is most often important to rural livelihoods and a customs union is unlikely to significantly impact the barriers that this faces and taxes are still being fixed separately by countries. However, the introduction of one-stop border posts being introduced and the reduction in tariff barriers are coming down progressively. The establishment of a common market will create both winners (numerous food producers and consumers on both sides of all borders) and losers (smugglers and the customs, police and local government officers who currently benefit from bribery at and around the borders) in the border areas. More substantial impact could be attained by a new generation of investments in world-market production based on the region's comparative advantages in natural resources (especially mining and agriculture) and the new tariff structure creates marginally better conditions for world-market exporters, by cheapening inputs and by reducing upward pressures on the exchange rate. EAC heads in 2009. From left to right: Yoweri Museveni (Uganda), Mwai Kibaki (Kenya), Paul Kagame (Rwanda), Jakaya Kikwete (Tanzania), Pierre Nkurunziza (Burundi). On 1 July 2010, Kenyan President Mwai Kibaki launched the East African Common Market Protocol, an expansion of the bloc's existing customs union that entered into effect in 2005. The protocol will lead to the free movement of labour, capital, goods and services within the EAC. Member states will have to change their national laws to allow the full implementation of some aspects of the Common Market such as immigration and customs. This legislation may take up to five years for each of the countries to enact fully but official recognition of the common market took place on 1 July. Kenya expects that its citizens will begin to enjoy freedom of movement in the EAC within two months. Kenya, Rwanda and Burundi have already agreed to waive work permit fees for EAC citizens. The Common Market is seen as a step towards implementation of the common currency by 2012 and full political federation in 2015. Kenyan businesses complain that the benefits of the Common Market only exist on paper by 2011, and that all the work remains to be done. Arbitrary rules and delays continue to make trade between Kenya and Tanzania expensive and difficult. The free movement of people in the EAC is set to be improved with the introduction of "third generation" ID cards. These cards will identify the holder as a dual citizen of their home country and of "East Africa". Third generation cards are already in use in Rwanda with Kenya set to introduce them in July 2010 and the other countries following afterwards. Mutual recognition and accreditation of higher education institutions is also being worked towards as is the harmonisation of social security benefits across the EAC. Mombasa has the East African Community's busiest port. However, the construction of a new port in Kenya, known as the Lamu Port is underway. It is expected to cost US$22 billion. Upon completion, the Bagamoyo port under construction in Tanzania will be the largest in Africa, with a capacity to handle 20 million cargo containers a year. Many of the EAC's largest firms are headquartered in Nairobi, including Kenya Airways, the Nation Media Group, and the Kenya Commercial Bank Group. The multinational firms with their regional headquarters in Nairobi include Google, Coca-Cola, and Toyota. The city is also home to the Nairobi Securities Exchange. According to a 2007 published report, it is Africa's fourth largest in terms of trading volumes and fifth largest in terms of market capitalization as a percentage of gross domestic product. The new treaty was proposed with plans drawn up in 2004 to introduce a monetary union with a common currency, the East African shilling, some time between 2012 and 2015. There were also plans for a political union, the East African Federation, with a common President (initially on a rotation basis) and a common parliament by 2010. However, some experts like those based out of the public think tank Kenya Institute of Public Policy Research and Analysis (KIPPRA), noted that the plans were too ambitious to be met by 2010 because a number of political, social and economic challenges are yet to be addressed. The proposal was the subject of National Consultative discussions, and a final decision was to be taken by the EAC Heads of State in mid-2007. In 2013 a protocol was signed outlining their plans for launching a monetary union within 10 years. In September 2018 a committee was formed to begin the process of drafting a regional constitution. It had been hoped that an East African Single Tourist Visa may have been ready for November 2006, if it was approved by the relevant sectoral authorities under the EAC's integration programme. Had it been approved, the visa would have been valid for all three current member states of the EAC (Kenya, Tanzania and Uganda). Under the proposal for the visa, any new EAC single visa could be issued by any member state's embassy. The visa proposal followed an appeal by the tourist boards of the partner states for a common visa to accelerate promotion of the region as a single tourist destination and the EAC Secretariat wanted it approved before November's World Travel Fair (or World Travel Market) in London. When approved by the EAC's council of ministers, tourists could apply for one country's entry visa which would then be applicable in all regional member states as a single entry requirement initiative. A single East African Tourist Visa for the EAC countries of Kenya, Rwanda, and Uganda has been available since 2014. As of July 2015, the combined population of all five EAC member states was 169,519,847. The EAC would have the ninth largest population in the world, if considered a single entity. The EAC contains 5 cities with populations of over one million, the largest being Dar es Salaam. Kampala is the largest urban centre located on Lake Victoria, the second largest freshwater lake in the world and Mwanza coming in second and Kisumu third. English is designated as the official language of the EAC, with Kiswahili, often known as Swahili, designated for development as the lingua franca of the community. Within the EAC, there are two countries whose official language is French: Rwanda and Burundi. Numerous local languages are also spoken: for example, there are 56 local languages spoken in Uganda and 42 local languages in Kenya. Kinyarwanda is spoken in Rwanda and Uganda. In Kenya and Uganda, the medium of instruction in all schools is English. Rwandan president Paul Kagame at the 2006 EAC summit. Rwanda joined the EAC on 1 July 2007. The East African passport was launched on 1 April 1999. The East African passport has been introduced as a travel document to ease border crossing for EAC residents. It is valid for travel within the EAC countries only and will entitle the holder to a multi-entry stay of renewable six months' validity in any of the countries. The passport is issued in three of the five EAC member states (Kenya, Uganda and Tanzania). The passports are available at the headquarters of the respective Immigration Departments in Nairobi, Kampala and Dar es Salaam. Only East African nationals may apply to be issued with the passports. The passport costs US$10 or the equivalent in EAC currencies. Processing of applications for the passports will normally take two to three weeks. Although the passport is only valid within the EAC, modalities of internationalising the East African passport were being discussed with the aim towards having a common travel document for EAC residents by 2006. Other measures meant to ease border crossing for East African Community residents include the issuance of interstate passes (which commenced on 1 July 2003), a single immigration Departure/Entry card (adopted by all three member states), the finalisation of harmonised procedures of work permits and the classification process, and the compilation of studies on the Harmonization of Labour Laws and Employment Policies (now in its final stages). ^ a b c "Development and Promotion of Extractive Industries and Mineral Value Addition". www.eac.int. ^ "Report for Selected Countries and Subjects". Retrieved 3 December 2016. ^ "East African Community – Quick Facts". Eac.int. Archived from the original on 19 March 2009. Retrieved 2010-07-01. ^ a b c "FACTBOX-East African common market begins". Reuters. 1 July 2010. Retrieved 1 July 2010. ^ a b "East African trade bloc approves monetary union deal". Reuters. 30 November 2013. ^ a b "Ready for a United States of East Africa?". ^ "From Co-operation to Community". eac.int. Archived from the original on 2008-05-10. ^ "EAC Update E-newsletter". www.eac.int. Directorate of Corporate Communications and Public Affairs. Archived from the original on 26 April 2012. Retrieved 10 December 2011. ^ "East African Economic Community". Crwflags.com. Retrieved 2010-07-01. ^ "– Born in anonymity". Ms.dk. Archived from the original on 22 July 2007. Retrieved 1 July 2010. ^ We Celebrated at EAC Collapse, Says Njonjo. ^ "History of the EAC". EAC. Archived from the original on 21 December 2016. Retrieved 20 December 2016. ^ a b "East African Nations agree to disagree". All Africa. 30 November 2016. Retrieved 20 December 2016. ^ a b "South Sudan: Big trading potential for EAC". IGIHE. 8 July 2011. Retrieved 9 July 2011. ^ Mazimpaka, Magnus (8 July 2011). "South Sudan: Rwanda Hopeful of South's Strategic Link to North Africa". allAfrica. Retrieved 9 July 2011. ^ "Welcome South Sudan to EAC!". East African Business Week. 10 July 2011. Archived from the original on 27 September 2011. Retrieved 10 July 2011. ^ "South Sudan to link to Kenya oil pipeline". Reuters. 6 July 2011. Retrieved 19 October 2011. ^ "South Sudan needs African neighbours to survive". DAWN. 8 July 2011. Retrieved 9 July 2011. ^ "South Sudan 'free to join the EAC'". The Citizen. 12 July 2011. Retrieved 12 July 2011. ^ Amos, Machel (17 September 2011). "South Sudan delays membership in regional bloc". Daily Nation. Retrieved 18 September 2011. ^ "South Sudan readies for EAC membership". Archived from the original on 21 October 2011. ^ "Uganda says South Sudan likely to join EAC in 2014". Xinhua News Agency. 9 September 2013. Archived from the original on 14 November 2013. Retrieved 17 October 2013. ^ "Ugandan MPs oppose South Sudan joining East African community". The Africa Report. 7 October 2013. Retrieved 17 October 2013. ^ "Tanzania warms up to South Sudan membership". The EastAfrican. 8 December 2012. Retrieved 21 November 2013. ^ "EAC prepares to admit South Sudan". The EastAfrican. 11 May 2013. Retrieved 21 November 2013. ^ "allAfrica.com: East Africa: EAC to Decide On South Sudan Admission by April 2014". allAfrica.com. Retrieved 9 May 2015. ^ "South Sudan defers EAC admission". The Observer. Observer Media Ltd. Retrieved 11 May 2014. ^ "COMMUNIQUÉ: SIGNING CEREMONY OF THE TREATY OF ACCESSION OF THE REPUBLIC OF SOUTH SUDAN INTO THE EAST AFRICAN COMMUNITY". East African Community. 15 April 2016. Archived from the original on 24 April 2016. Retrieved 15 April 2016. ^ "Germany Ambassador pays courtesy call on EAC Secretary General". East African Community. 9 May 2016. Archived from the original on 24 June 2016. Retrieved 1 June 2016. ^ "Republic of South Sudan deposits Instruments of Ratification on the accession of the Treaty for the establishment of the East African Community to the Secretary General". East African Community. 5 September 2016. Archived from the original on 11 September 2016. Retrieved 5 September 2016. ^ "Successes and Failures of the East African Community - The Best of Africa". The Best of Africa. 2017-07-11. Retrieved 2018-03-01. ^ Waigwa, Samson (29 April 2007). "Tanzania: Fast-Tracking Political Federation" – via AllAfrica. ^ Makabila, Stephen (8 May 2007). "Kenya: Tears for Mt Elgon As Schools Re-Open" – via AllAfrica. ^ Kirunda, Kakaire A. (14 May 2007). "Uganda: Sabiny Demand Land As K'jong Raids Reduce" – via AllAfrica. ^ "Daily Times | Malawi News | Sunday Times | The Weekend Times". The BNL Times. 11 March 2010. Retrieved 2010-07-01. ^ Ihucha, Adam (18 September 2011). "EAC split on Khartoum's bid to join community". The East African. Retrieved 18 September 2011. ^ "Why Sudan's EAC application was rejected". 2011-12-05. Archived from the original on 2013-07-05. Retrieved 2013-07-04. ^ "Somalia applies to join EAC bloc". 98.4 Capital FM. 2012-03-06. ^ "COMMUNIQUÉ OF THE 14TH ORDINARY SUMMIT OF EAC HEADS OF STATE". East African Community. 2012-11-30. Archived from the original on 2015-04-02. Retrieved 2015-03-15. THE SUMMIT CONSIDERED THE APPLICATION OF THE FEDERAL REPUBLIC OF SOMALIA TO JOIN THE EAST AFRICAN COMMUNITY. THE SUMMIT DIRECTED THE COUNCIL TO ENGAGE THE FEDERAL REPUBLIC OF SOMALIA AND UNDERTAKE A VERIFICATION PROCESS OF THE APPLICATION AND REPORT AT THE 15TH SUMMIT OF EAC HEADS OF STATE. ^ "East African body rejects S. Sudan, Somalia membership bids". 2012-12-04. Retrieved 2013-07-04. ^ "Not yet, S. Sudan and Somalia told by East Africa Community". Daily Nation. 20 February 2015. Retrieved 15 March 2015. ^ Agritrade. "Final stage of EPA negotiations generating tensions between EAC members". CTA. Retrieved 17 April 2014. ^ Agritrade. "Launch of EAC–US TIP negotiations potentially complicated by other trade agreements". CTA. Retrieved 17 April 2014. ^ a b "EA Market Protocol officially launched". Kenya Broadcasting Corporation. 1 July 2010. Archived from the original on 2 July 2010. Retrieved 1 July 2010. ^ "Five East African Nations to Declare Common Market Tomorrow". Business Week. 1 July 2010. Retrieved 1 July 2010. ^ a b "Kenya fetes EAC Common Market with work permit fee waiver". Business Daily. 1 July 2010. Retrieved 1 July 2010. ^ Kagwe, Winfred (19 May 2011). "Kenya: Traders Say Common Market Yet to Benefit Them" – via AllAfrica. ^ "What are the goodies in the EAC Common Market Protocol?". The Standard. 1 July 2010. Archived from the original on 29 March 2012. Retrieved 1 July 2010. ^ a b "Dawn of an era for East Africans". The Standard. 1 July 2010. Archived from the original on 19 October 2011. Retrieved 1 July 2010. ^ "Kenya Fights Off Port Competition With $13 Billion Plan: Freight". Bloomberg L.P. 2013. Retrieved 12 January 2014. ^ "Logistics: China Builds The Biggest Port In Africa". www.strategypage.com. ^ Millennium IT. "Live Trading commences at Nairobi Stock Exchange". millenniumit.com. Archived from the original on 2008-12-03. Retrieved 28 June 2007. ^ "Single East African visa for tourists coming in November". Archived from the original on 2008-05-31. ^ "East Africa geared for single tourist entry visa program". Archived from the original on 2009-03-05. ^ Fran. "In 2014: a single East African visa for seamless traveling". Your African Safari. Retrieved 9 May 2015. ^ "East African Community (EAC)". Africa-union.org. Archived from the original on 30 June 2010. Retrieved 1 July 2010. ^ a b c d e "Ministers Sign Memorandum of Understanding". EAC News ... Archived from the original on 2007-09-28. ^ a b c "Travelling in East Africa". Archived from the original on 2008-05-11. 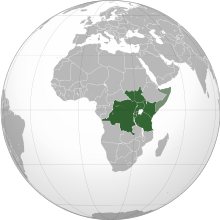 Wikimedia Commons has media related to East African Community.